We break down a few of the surprising ways trailerable power catamarans are winning hearts and minds. There’s a unique breed of cat on the prowl. It’s the trailerable power catamaran, and it’s gaining territory and mindshare with boaters in the coastal and inland waters of the U.S. Lighter, stronger, shallower and better equipped than cats of yore, these towable felines can go where others fear to venture, and they can get there at high speeds by water. And by land. Boaters who haven’t considered a catamaran lately may be surprised at how well they can cruise, fish, pull boarders and skiers, and head offshore, all with economic engines, sophisticated features and improved accommodations. A discussion about trailerable cats isn’t complete without addressing the issue of trailering. In general, towing width limits (without a permit) are 8 feet, 6 inches, but some states allow loads up to 10 feet wide before owners have to file paperwork. 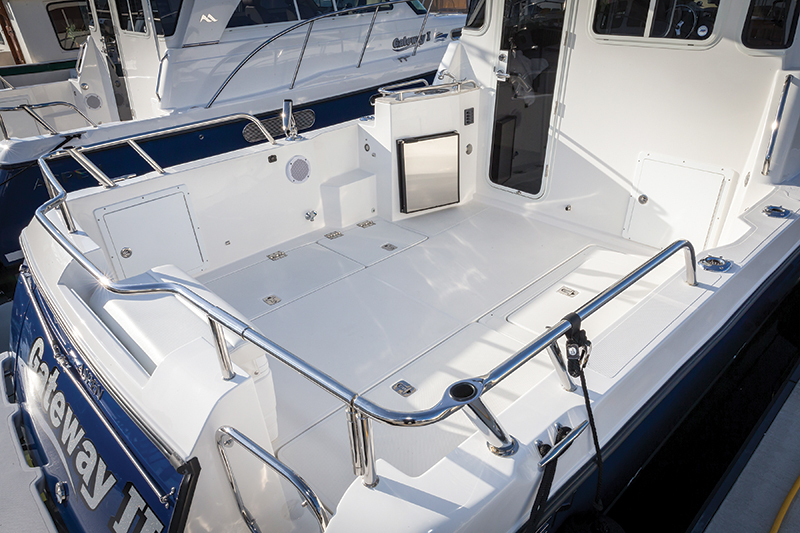 That leaves buyers with lots of options, such as the Twin Vee OceanCat 260 Exuma center console (8 feet, 6 inches) or the World Cat 295 Dual Console (9 feet, 6 inches) whose open bow seating is a fit for family fun. For easy loading and unloading, cat trailers have tracking pads for both hulls to get them on straight without much fuss. Also, some people argue there’s less windage forward with cats, and the lower air resistance while traveling 70 mph down the freeway may translate to less work and greater fuel efficiency for the tow vehicle. Speaking of fuel economy. By design, cats have shallow hulls and less wetted surface to drag through the water. That translates to better fuel efficiency. Some of this is inherent to the twin-hull concept and some of it is due to better, lighter construction methods, including closed-cell foam coring and vacuum infusion. Today, a 28-foot cat with a 10-foot beam can weigh less than 8,000 pounds and cruise in the mid-teens while burning only three to five gph. Also, cats are speed demons that tend to squat less and have good holeshot times. The 24-foot Splendor takes only three to four seconds to get on plane and reaches 30 mph in six or seven seconds. 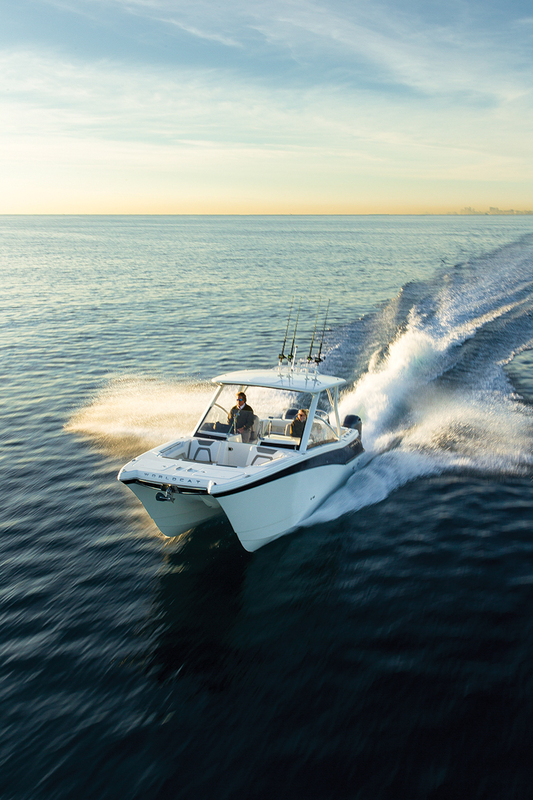 Freeman Boatworks in South Carolina offers the 29 VH, which cruises at 45 mph and burns 1.6 mpg (dependent on sea conditions), so owners can get to the fish first. Most cats can plane on one engine and retain surprisingly good handling, and that adds peace of mind when it’s time to get home. Speaking of handling, cats have gotten a bad rap in the past for their motion in a seaway, but that’s changed. With wave-slicing hull shapes — that in some cases are vented — and new tunnel designs that compress air to create a sort of air cushion, power cats slap less into head seas and provide a softer high-speed ride than they used to. There are fewer thumps, shudders and rattles, even in short choppy seas. These narrower cats are also responsive in turns and have little to no lean. Learning to drive a cat is relatively easy, because the twin engines are set wider apart for better control, especially in reverse. 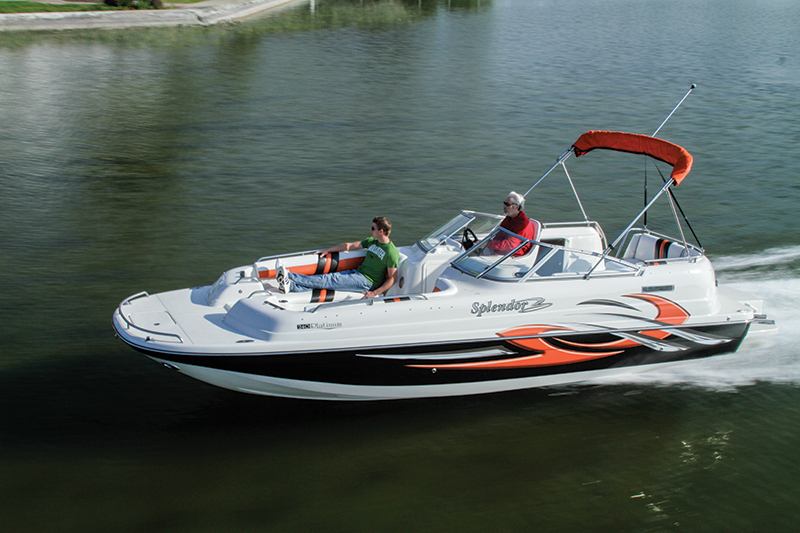 Add to that advanced features such as SeaStar hydraulic steering with PowerAssist for fingertip handling without the need for bow or stern thrusters, even during close-quarters maneuvering. Propulsion on smaller cats is usually provided by outboards, but not necessarily. Some of these diminutive cats offer inboards, which make for a clearer aft deck that’s suitable for fishing and family water access. Due to modern construction techniques and materials, these cats can carry larger, heavier engines. On the opposite front, a single engine saves weight and space and will deliver better economy. Take Washington-based Aspen. It places a single engine in the wider starboard hull, which also has a fixed keel and rudder. The other hull on the proa design is 35 percent thinner and has no underwater appendage, resulting in 50 percent less drag. With asymmetric hulls, the boat is balanced and tracks straight. One engine will always use less fuel than two, and with only one shaft, prop and rudder, there’s less to maintain or damage. Today’s small power cats are built strong and fast, and they’re more sophisticated. To increase their versatility, they can go offshore thanks to big-boat features such as advanced electronics packages, large tankage, full galleys with plenty of refrigeration and good sleeping accommodations. For example, the 32-foot Aspen C105 Expedition model has two cabins and a full head below, a complete suite of navigation and communication electronics, and a galley with a three-burner stove. 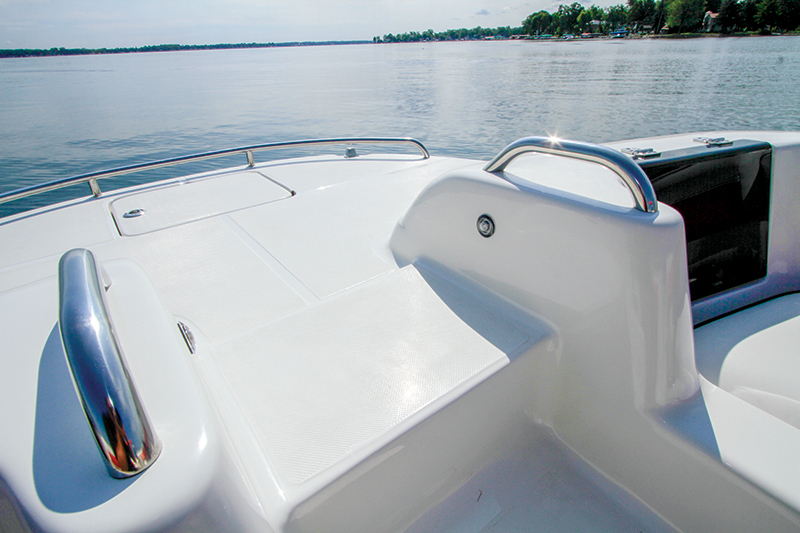 With up to 120 gallons of fuel, the boat’s range is 300 to 400 miles at 18 mph and 1,000 to 1,600 miles at trolling speeds in a wide variety of conditions. 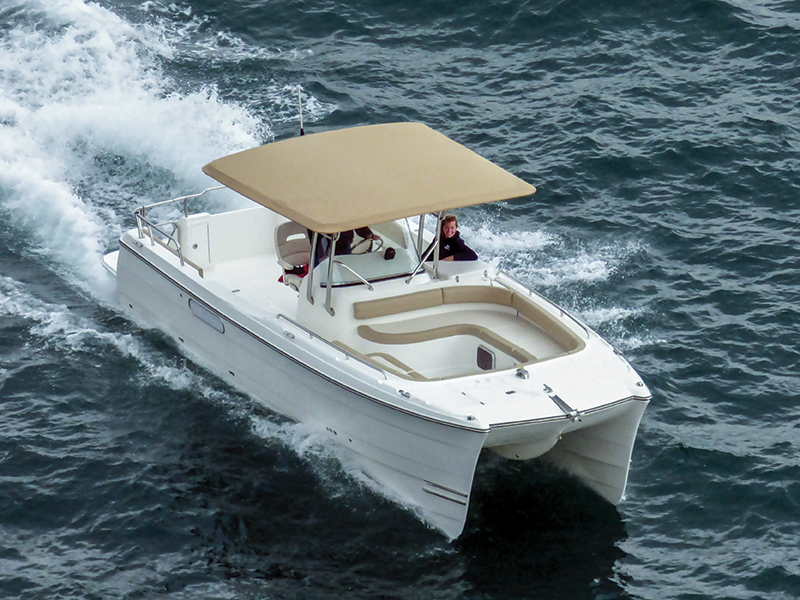 The C105 and Florida-based ArrowCat’s 320 also have more covered outdoor space, so passengers can enjoy the environment and still be protected from rain or the punishing sun. Excellent stowage, greater load capacity and options such as integrated 100-quart or bigger coolers and solar panels also make cats more cruise-worthy, so boat owners don’t have to go big to go far. A fish-cat is not an oxymoron. In fact, cats get high marks for fishability. As mentioned before, they’re stable, so it’s easy for anglers to focus on the fish and not their balance as they reel one in, and a day of angling won’t result in as much knee/back/ stomach muscle strain. Second, they have plenty of room for all the necessities of fishing, including rod holders, rocket launchers, fishboxes and livewells. Now the crew can’t say they had to let the big ones go because they didn’t have room to bring them home. Finally, a cat allows people to fish from multiple angles, including from the side and from the usually expansive foredeck. Take the Calcutta 26. 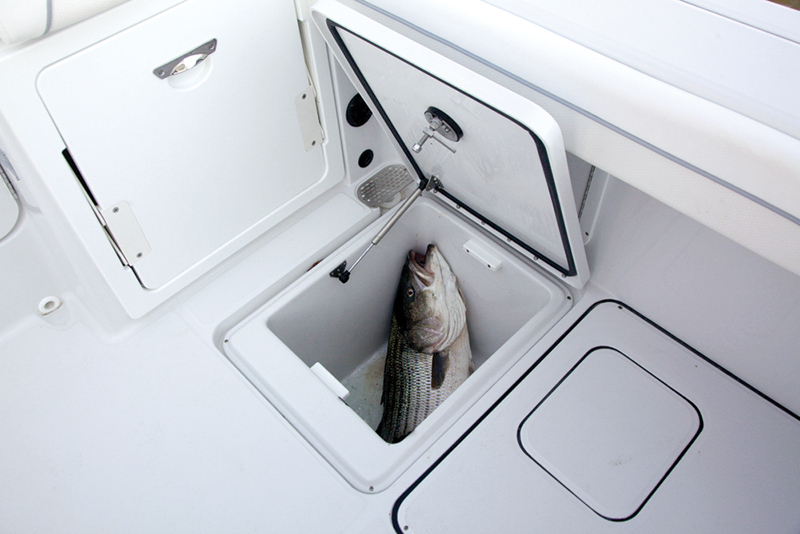 It has a center console walkaround design and a double-level foredeck for two or more anglers to cast from. Fishability depends on the manufacturer’s focus and priorities. For example, while World Cat and Glacier Bay share the same owner, the former is a fishing boat that can cruise, while the latter is a cruising boat that can fish. Regardless of whether owners want to fish or cruise, there are lots of different styles to choose from, including cuddy cabin and center-, single- and dual-console models. There are even cats that look like deckboats. Indiana-based Splendor builds deck and cuddy cabin models on twin hulls. 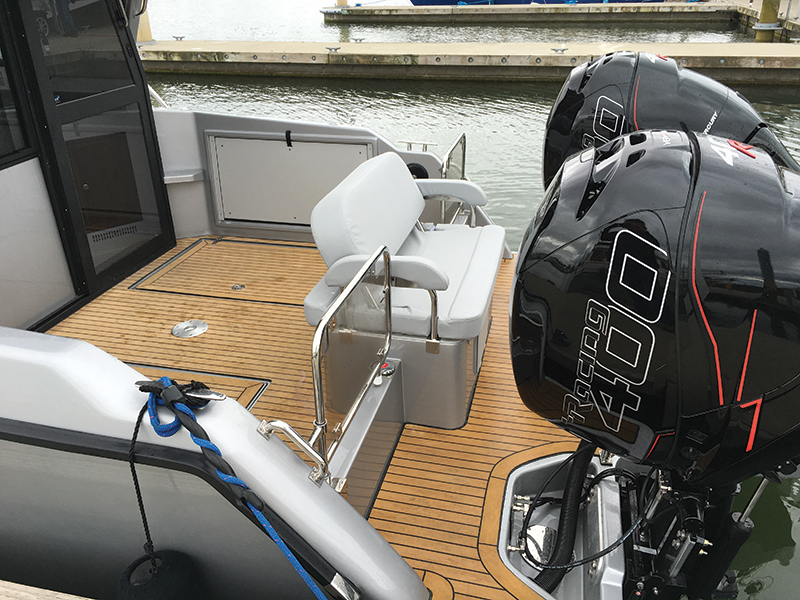 The foredeck of its 24- and 25-footers can serve as casting platforms but below is a cabin, and that means the crew can go farther and stay overnight in more comfort. Additionally, with a 12-inch draft, these (and other cats) can run in shallower water, allowing owners to visit and/or fish in locations that other boats can’t reach. Arguments have been made in the past that it’s difficult to find slips for cats due to their beam and, of course, end ties are few and far between. But consider the trend that monohull power and sailboats are getting beamier. For example, Beneteau’s Oceanis 31 sailboat has a beam of 11 feet, 1 inch, and Yellowfin’s 32 Offshore center console is 9 feet, 9 inches wide. Meanwhile, the 32-foot Aspen C100 power cat has a 10-foot beam. 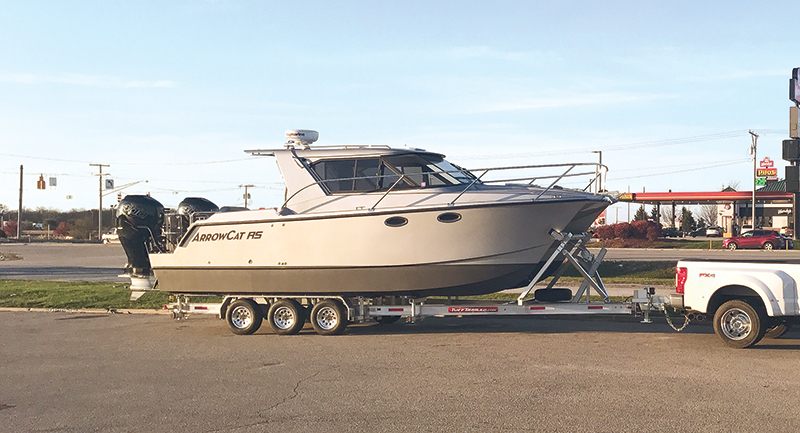 To accommodate this design evolution, slips have become wider too, so owners won’t need to find and pay for a 40-foot slip for a 30-foot cat, if they decide to ditch the trailer and keep the boat in the water for the season. When power cats were new, some industry folks argued that they were a waste of money because surely “there would be no market for used cats.” Oh, the irony. At least a dozen top-name trailerable power cat manufacturers are producing hulls now, so the “newfangled” is no longer “weird.” The designs have gained in popularity and acceptability. But there are still few small(ish) power cats on the secondary market as compared with monohulls, and given their high-quality construction and advanced features, they’re holding their value. An investment in a cat is no different than in any other boat, and in some cases, their relative rarity will actually make a seller’s wallet happy. I love my C-Dory Tomcat. The stability created by the cat design makes it the best boat I have ever owned, especially when gearing up on deck in heavy scuba gear. I will never buy a monohull again after being spoiled by this boat. You missed out on the one we own. C-Dory TomCat 255. West Coast and affordable. It’s now 13 years old and has been everywhere from Cabo San Lucas BCS Mexico to Skagway, AK. to the Trent Severn Canal Ontario, CA. to Key West Florida. Towed over 80,000 miles, operated over 1200 hrs on the water.